Mercedes-Benz has once again teamed up with LEGO to produce another Technic set - the Arocs 3245. The new construction truck set follows the Unimog model from 2011. With 2793 pieces, including power functions and pneumatic actuators, it's one of the most complex models in the Technic range. When completed it will measure 54cm in length. The Arocs model comes with four axle suspension, an outrigger, a new turntable element, pumps, and the new Pneumatics 2.0 system, which offers an easier, more realistic way of connecting cylinders and hoses. As with all big LEGO Technic models, there is also an alternative model that can be constructed - in this case an articulated construction truck which is even bigger at 77cm long. The LEGO team visited the Mercedes-Benz Trucks factory in Wörth to see how the Arocs is built, to ensure the model replicated as many of the real truck's details as possible. "It is a perfect fit for LEGO Technic," said LEGO Senior Marketing Manager Niels Henrik Horsted. "Whenever we design a new set, our aim is to give Technic builders a stunning model that looks as detailed as its real life version as possible. It should have all the main functionalities you would expect." 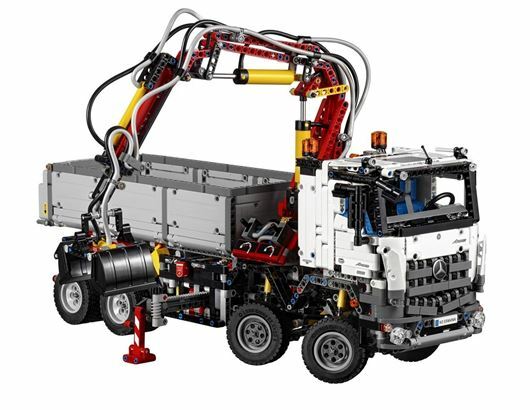 The LEGO Technic Mercedes-Benz Arocs 3245 will be available from August 1st 2015.